What is the meaning of this Mt. Fuji sign? I read through your Climbing Mt. Fuji guide page and was wondering if you had ever seen this? I climbed the mountain a few years ago and had a picture of it, however I had a break in and they took my hard drive with all my photos on it. The pound signs are numbers (6). Can you help me out? Comments for What is the meaning of this Mt. Fuji sign? I will keep visiting to see more articles. 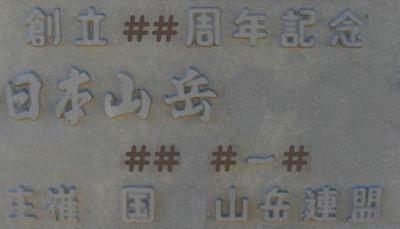 It seems that the plaque may be commemorating the ? ?th year anniversary of some unknown event, and was perhaps funded or sponsored by a mountain climbing association such as the Japan Mountaineering Association (http://www.jma-sangaku.or.jp/cominfo/) or the Japanese Alpine Club (http://www.jac.or.jp/).